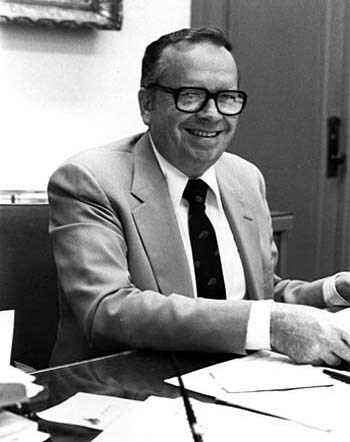 Former director of the Minnesota Historical Society Russell W. Fridley died on June 17, 2010. He was director of the Historical Society for thirty years, during a dynamic and formative period of the institution’s history. He had a true commitment to history in all its forms. He believed that popular and scholarly history were compatible and that neither would diminish the other. For Russell Fridley history was a big tent and all kinds of history could exist there. No history of any kind diminished any other kind of history. But he was a supporter of detailed, well-researched, and well-documented history. He supported new ideas when they came along. When someone came to him with a new idea, he was always encouraging. “Why don’t you work on that?” he would ask. That did not always mean that he could find money to support your particular project, uncertainties being what they were. But he was unfailingly curious about what you were doing, what you were researching. When you told him, probably in too much detail, he would respond with a pleasant, humorous, or encouraging comment. He was good with the legislature, in getting money for the historical society, and good with his staff, in getting productive work out of them. He did not believe that Vikings carved the Kensington Runestone, but even supporters of the Runestone liked Russell Fridley. They would invite him to come debate with them. The worst that anyone would say about him was that he was too affable, a fact which would make suspicious people more suspicious. Russell Fridley’s commitment to the work of history in all its forms is greatly missed. I remember when I was editing the first edition of John Koblas’s book “F. Scott Fitzgerald: His Homes and Haunts,” I was trying to find out whether Scott, who was in St. Paul’s select set only because of his wealthy Grandmother McQuillan, felt marginalized. I don’t know how Russell personally got involved: maybe I mentioned it to him, maybe June Holmquist did. In any case, Russell, wanting to help me clear up the issue, invited Charles and Elizabeth Ames, who had moved in Fitzgerald’s circle as children and young people, to come in and discuss it with me. The Ameses were unquestionably among the St. Paul elite. We met in Russell’s office and we talked. I asked them if Fitzgerald felt he didn’t fit in the top tier of St. Paul society. They insisted no, they had always treated Fitzgerald the same as everyone else. Which doesn’t necessarily mean he did not feel out of his league. A director taking that much personal interest in getting the historical record accurate seems really extraordinary. Ginny, so nice to hear these recollections and to remember what a fine and extraordinary person and father he really was – – – how lucky we were to have him in our lives. Thank you, Bruce White, for the positive memories of my dad. Our family enjoyed reading them. Thank you, Ginny, for your kind words too. This is one more example of Russ’s interest in many areas of the state’s history, his concern to make sure it was well documented, and his willingness to support opportunities for even new and lowly staff members. The comments from Bruce, Ginny, and Debbie remind me keenly of my own first recollection of meeting Russell Fridley. It was in December, 1957, over lunch at the old Port’s restaurant on Grand Avenue (now the location of a CVS pharmacy). He and June Holmquist had invited me to talk about a possible part-time position as research assistant to a young scholar who was undertaking a biography of Ignatius Donnelly. It turned out that Russell himself was deeply interested in Donnelly and he deplored the loss of the historic Donnelly house at Nininger, just north of Hastings. It had been demolished several years earlier, in spite of heroic efforts to save it. Now Russell had managed somehow to find the money for a research grant to support the biography project. My first question was “Who the heck is Ignatius Donnelly?” Most of the interview was spent answering it, I decided to take the job, and the rest, we might say, “is History.” Although the Donnelly biography never got written, sixteen years later Russell supported another biography project when he gave me a year’s sabbatical leave to work on a book about Henry Hastings Sibley. He was never as intrigued with Sibley as he had been with Donnelly, nor was I, and I think both of us took real satisfaction in the Donnelly exhibit, which was mounted in 1981, when I was overseeing the Society’s museum program. But those were only a couple examples of Russ’s appreciation of Minnesota’s past. It ranged from the Kensington Runestone to the state’s dynamic political history, and he knew more about both subjects than most Minnesota historians. It was for that reason that I asked him last year to review the manuscript I had put together on the state’s tradition of protest politics. He agreed at once, and he had a number of helpful suggestions when we met in December to discuss it. That was my final visit with Russell. I feel fortunate to have had him as a friend and colleague for 42 years.